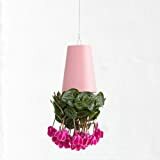 If you live in a small indoor space and love plants, here's one way to make the most of all that dead space above your head. 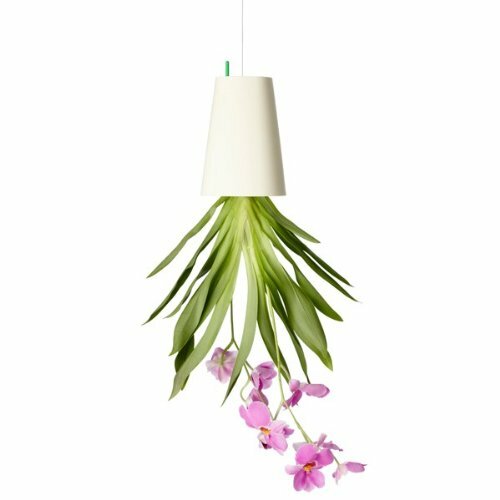 Sky Planters let you grow plants from the ceiling! Anyone living in a small apartment will know how frustrating it can be when you can't find enough space to put your plant pots. They look great of course, but they take up a lot of room. It's the same problem at work - sometimes space is at a premium, but wouldn't your office look great if you could display some beautiful plants which wouldn't get in the way? Now however, some smart designers have come up with the idea of growing plants upside down, defying gravity! Think about all that spare space you have on your ceiling and turn it into a growing area. They come in all sizes and colors, so there's bound to be something for your particular situation. Growing Plants Upside Down! How Does it Work? The particular make of Sky Planter I am describing here is the Boskke Sky Planter. You might be wondering why the plant and the soil don't fall out when it's upside down! 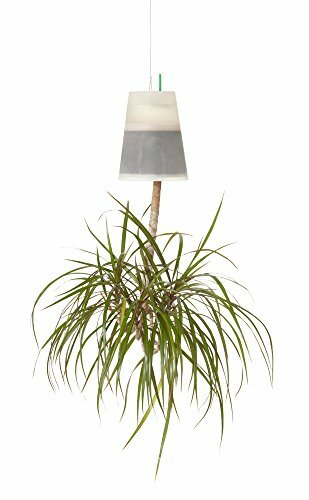 Well, the ingenious design has been carefully thought out and includes a locking disc and mesh which holds the plant and soil in place. Another intriguing feature is the internal reservoir system. This feeds water to the plant very gradually so that normally you will only have to water the plant a couple of times a month. Have a look at this short video to see how easy it is to set up the Sky Planter. This really is 'Urban Gardening' at its best! What I love about this idea is growing herbs and also plants like strawberries and maybe tomatoes in the kitchen area - all ready to pick when needed and fresh too. I don't know about you, but my kitchen is very small and I have very little space for anything, let alone plants! So this would be an ideal solution for me. Plants prefer natural light of course - and it's normal for them to reach out for the light source. So - in order to make sure your plants vary in their direction, just turn them around occasionally, as you would normally. 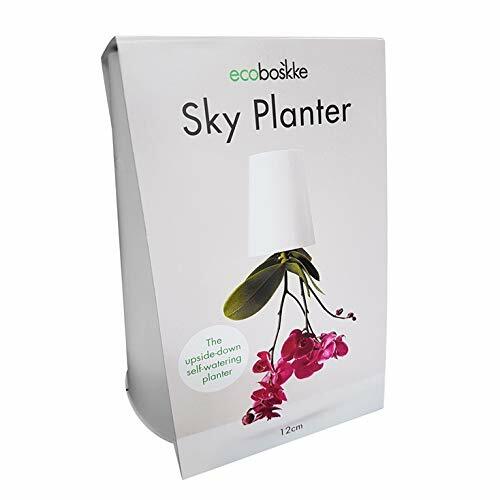 The Sky Planter comes with full instructions and all the fittings you will need. Sky Planters should be installed in a solid ceiling, i.e. concrete, or one with wooden beams which can be drilled into. 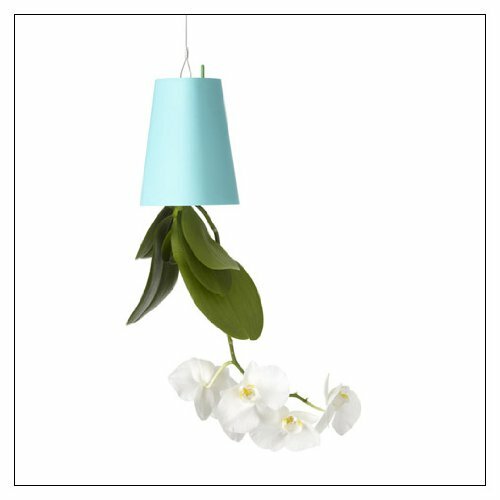 If your office or home has a false or plaster ceiling, then don't attempt to hang the Sky Planter from this area. Check before you buy. Although they are made for the indoors, it is possible to hang these Sky Planters outdoors too - just remember that the soil will dry out more quickly so your plant will require watering more frequently. Also - keep the Sky Planter protected from strong winds. Upside Down Plants Can Look Strange at First! I think it might take some getting used to seeing certain plants growing upside down! Ivy and other climbing plants and spider plants with their little 'babies' growing from them don't look so strange because they are naturally winding and curvaceous. But plants that normally grow straight up might take some getting used to. However, all plants grow towards the light, so eventually even the most rigid plant will begin to curve and give us a completely new side of itself! And don't forget, if you went into the jungle you would be surrounded by plants growing in all directions, up down and sideways, and you wouldn't think twice about it. With more and more people living in cities and space at a premium in both homes and offices, this is a really brilliant idea. I've thought of trying this with vegetables and herbs. Some day I actually might get around to doing it. Very cool and one interesting and artful way to keep the pets out of the plants. It's possible to attract a variety of birds into the garden by choosing plants that provide food and shelter. Here are some planting suggestions to create a haven for birdlife.